The Wheel of Fortune is among the 5 last trumps from the 22 major arcana that refer to the trials of the world and symbolize our chaotic path on earth, with the World, Judgment, the House of God, and the Chariot. The Wheel of Fortune does not directly mean financial wealth. It is a sign of change and opportunities. It is a dynamic Arcanum that symbolizes risk-taking and initiative. If you draw that Arcanum, here is what it says: be bold! 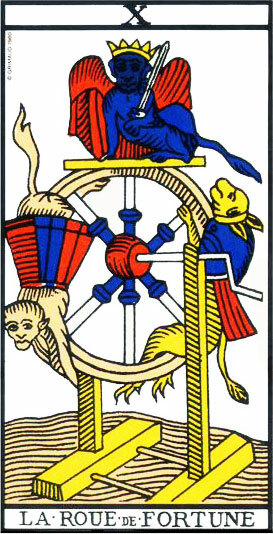 The Wheel of Fortune turns, bringing its share of solutions to your problems, allowing you to overcome any obstacle. It is tied to Fortune when it means “Good Fortune”, in other words: luck. It will bring swift and positive changes, success and victory. Thanks to that trump you will have Lady Luck on your side. It is auspicious for independent work, contracts, business, successful travel, and success in any artistic endeavor. Anyone drawing this Arcanum must however be wary not to be intoxicated with honor and success, leading to excessive spending. A little excess can however be tolerated because his or her courage, willpower and enthusiasm will allow that person to overcome many obstacles. This does not mean that everything will be easy because any success requires a certain amount of risk and is never without difficulty. Being successful means you have to try your best and never give up at the first hint of trouble. No one ever succeeds on the first try. Any famous person could confirm it. Read the biographies of your favorite stars or the people you admire and you will see all the problems they had to overcome before they were successful. If you are going through difficult times or had some bad times lately, the Wheel of Fortune heralds a more auspicious phase, or a happy ending to your current problem. 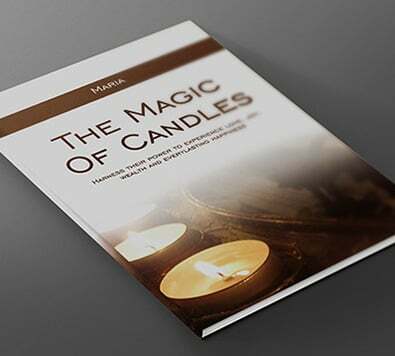 However, if you were already in an auspicious period, you can expect it to take a turn for worse, with some problems that you will be able to overcome before you lead a better life. The Hermit Tarot card: positive or negative?